Running heroes come in a couple of different styles. For some people it’s all about speed, and Mo Farah is the nation’s darling at the moment when it comes to going fast. For others heroism lies in going further than most and Chrissie Wellington or Mimi Anderson are perfect exponents of this. (indeed when we met Mimi at the Write This Run event earlier in the year it spawned the hashtag #WhatWouldMimiDo, a new running mantra for many). Me? I find heroism in the ridiculous, adventurous, insane and brilliant. Anyone can cross a start line and run where they are told, aiming for a finish line knowing there is water and food along the way and a cheering team of supporters at the end to welcome you in hours later. But to set off from the very Eastern edge of Canada with a plan no more complete than “run West” aiming to cover 5000 miles before the expiration of a visa with no support crew, that kind of absurdity I find heroic. So let me introduce Jamie McDonald. He likes to wear a Flash outfit and that’s just fine with me. Until March, when a tweet hit my timeline with a link to a video. He was at it again. 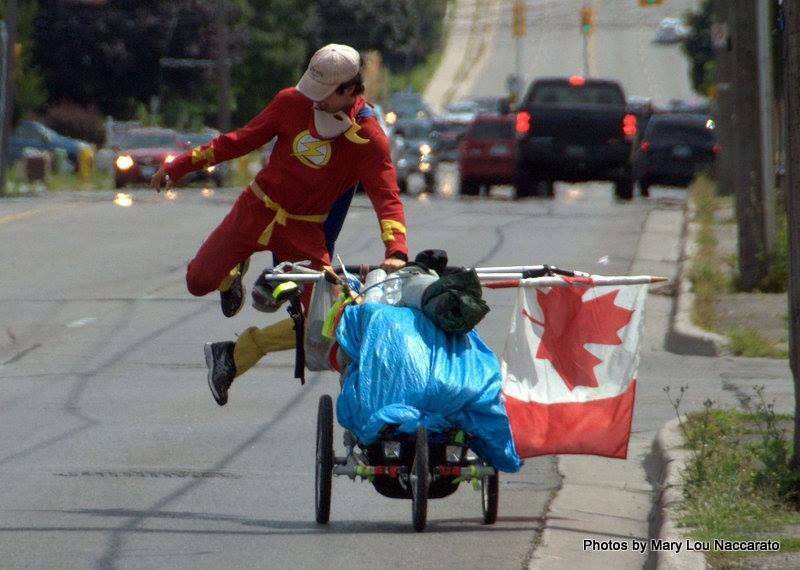 This time running 5000 miles across Canada, unsupported, racing against his visa expiry date. I’ve been following Jamie ever since through his fabulous video blogs and Facebook updates, and recently I was lucky enough to be able to ask him some questions about his adventures. The most obvious place to start…why?! But Jamie hasn’t gone completely without creature comforts during his trip. Not afraid to knock on a door and ask to sleep on front lawns he has been welcomed in to homes throughout Canada. Indeed now that word has spread through the internet and the interest of Canadian media, people are actively seeking Jamie to offer him support. From dropping off a food parcel to offering a bed in the next town people are inspired to be involved, and not forgetting those all important charity donations to. He’s been joined on the road by schoolchildren, bereaved parents, families and even some of the patients from the SickKids children’s ward in Toronto that he is raising funds for. Jamie being supported by the kids he’s supporting. Sick Kids, Toronto. Jamie’s video diaries are full of tales of generosity from the people of Canada, and it’s this as much as Jamie’s incredible achievements that makes this a story worth following. It’s unsurprising that Jamie creates such a desire in people to help, his enthusiasm is infectious (as is his laugh at the start of his videos!) and his gratitude so genuine. I get the impression he is honestly surprised every time someone does something nice for him. Jamie is now around the halfway point in his journey, it’s hard to tell when he has no set route. “It may sound a bit ridiculous, but I really do like the Forrest Gump theory of just waking up and running in the direction that I need to be running in” but there is no doubt that he still has a lot of road to cover and many adventures left to have along the way. 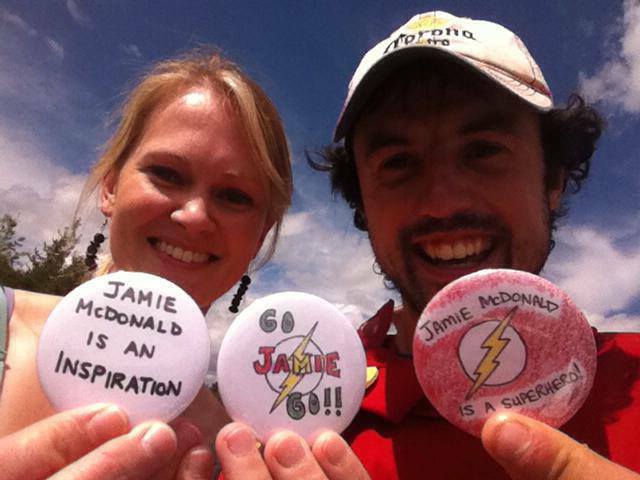 You can follow Jamie on Twitter and Facebook as well as through his videos which never fail to inspire. (His maniacal laughter in the first few seconds of his videos will make you smile every time you hear it!) You can also donate, which is the reason he’s out there eating tinned fish on the roadside after all! Every little helps and as you follow Jamie’s story you’ll see just what a difference your generosity makes to him and the children he is supporting. Finally I asked Jamie what advice he’d give a wannabe adventurer? “Stop thinking, have faith in the world and don’t plan anything, that’s adventure”. Great advice Jamie, but how about we plan that roast dinner for when you’re back?! 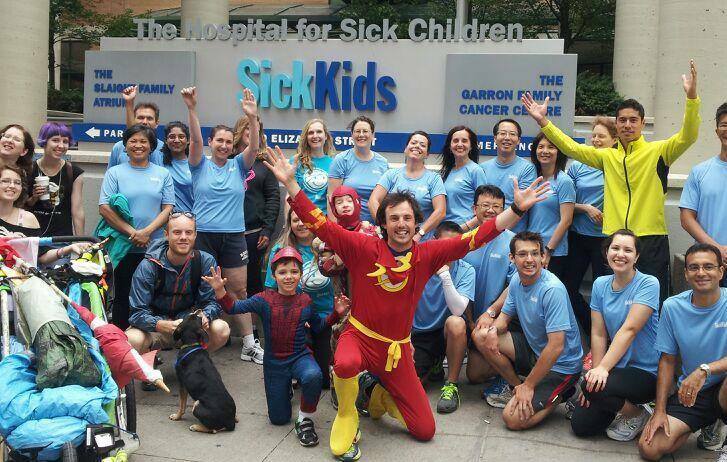 This entry was posted in Life, Running and tagged Canada, Charity, GOSH, Hero, Jamie McDonald, Pied Piper Appeal, Sickkids. Bookmark the permalink. Wow what an inspirational guy! I am going to reblog this as I think his story is amazing. I will definitely be following his updates on Twitter. He’s amazing…and that laugh is so infectious! Looking forward to his return and taking him for a beer to hear his story. That’s one helluvan inspirational story! Ain’t it just! Gives me terrifying ideas about pulling on my trainers and going, trusting in the world to see me right…maybe one day! Great story and an amazing guy. What a true inspiration in every sense of the word. That’s why he’s my hero :o) Enjoy following him on the second half of his journey, it’s going to be emotional and amazing!